Leprosy disease is a chronic granulomatous disease caused byMycobacterium leprae, an acid and alcohol fast bacillus. It is one of the most serious, disabling disease which attacks nerve and skin. Leprosy which is also called Hansens Disease is the commonest cause of peripheral neuritis and about 20 million of the population is affected by it. The most important mode of spread of Mycobacterium leprae is by droplets from the sneeze of leprosy patients, whose nasal mucosa is heavily infected. It is not certain whether the organism enters by inhalation or through the skin. The incubation period is between 2-5 years. 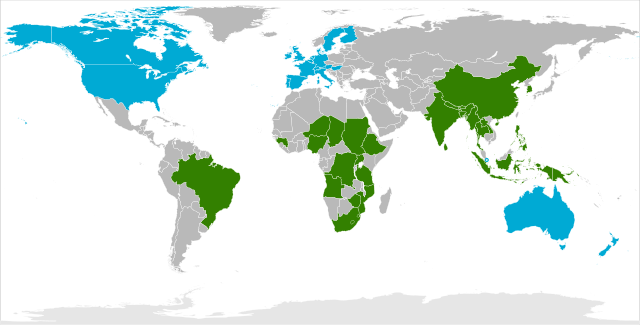 The leprosy disease is common in tropical countries like Asia, Far East, Tropical Africa, Central and South America and in some Pacific Islands. The disease is still endemic in Southern Europe, North Africa and the middle East. It is not absolutely sure how leprosy spreads from one person to another. We know that it is much less infectious than small-pox and many other diseases. Some people have such high resistance that they do not get infected by leprosy disease, no matter how closely they are in contact with any infectious person. Great majority of leprosy patients cannot infect other people. Even the few infectious patients are no longer infected if they have been taking adequate treatment for 3-6 months, though they do need to continue drug treatment for a very long time. This fact shows that leprosy is not dangerous as most of the people think. It is a chronic infectious disease of only man and attacks mainly nerves and skin. It is diagnosed and treated with drugs and it can be controlled with little precautions, which reduce physical damage or disability from occurring. Leprosy disease may cause great emotional distress to the patient and their families, and it may seriously affect the social life of the patient. All types of leprosy are caused by mycobacterium leprae. The amount of patient's resistance determines whether he/she can get leprosy at all and if he can, then which type he will get. According to the type and difference in resistance the skin sign changes. In tuberculoid, cases have good resistance. Borderline cases have only fair resistance and lepromatous cases have little or no resistance. Damage to hand and feet can occur in all three types, if the mycobacterium leprae damages nerve trunk. Because the bacteria that cause leprosy multiply very slowly, symptoms usually do not begin until at least 1 year after people have been infected. On average, symptoms appear 5 to 7 years after infection. Once symptoms begin, they progress slowly. Leprosy disease affects mainly the skin and peripheral nerves Characteristic rashes and bumps develop. Infection of the nerves makes the skin numb or the muscles weak in areas controlled by the infected nerves. Tuberculoid leprosy: A rash appears, consisting of one or a few flat, whitish areas. Areas affected by this rash are numb because the bacteria damage the underlying nerves. Lepromatous leprosy: Many small bumps or larger raised rashes of variable size and shape appear on the skin. There are more areas of numbness than in tuberculoid leprosy, and certain muscle groups may be weak. Much of the skin and many areas of the body, including the kidneys, nose, and testes, may be affected. 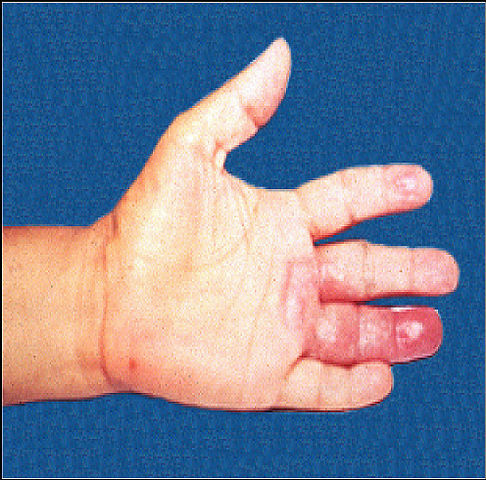 Borderline leprosy: Features of both tuberculoid and lepromatous leprosy are present. 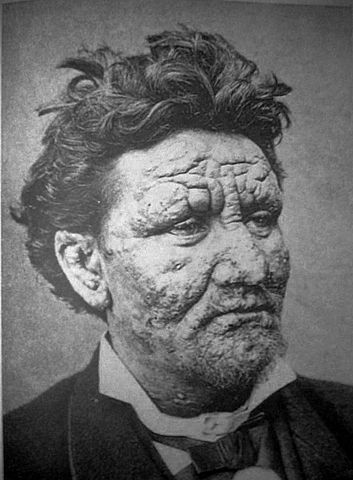 Without treatment, borderline leprosy may become less severe and more like the tuberculoid form, or it may worsen and become more like the lepromatous form. The most severe symptoms result from infection of the peripheral nerves, which causes deterioration of the sense of touch and a corresponding inability to feel pain and temperature. People with peripheral nerve damage may unknowingly burn, cut, or otherwise harm themselves. Repeated damage may eventually lead to loss of fingers and toes. Also, damage to peripheral nerves may cause muscle weakness that can result in deformities. For example, the fingers may be weakened, causing them to curve inward (like a claw). Muscles may become too weak to flex the foot—a condition called footdrop. Infected nerves may enlarge so that during a physical examination, doctors can feel them. Skin infection can lead to areas of swelling and lumps, which can be particularly disfiguring on the face. Feet: Sores may also develop on the soles of the feet, making walking painful. Nose: Damage to the nasal passages can result in a chronically stuffy nose and nosebleeds and, if untreated, complete erosion of the nose. Eyes: Damage to the eyes may lead to glaucoma or blindness. Sexual function: Men with lepromatous leprosy disease may have erectile dysfunction (impotence) and become infertile. The infection can reduce the amount of testosterone and sperm produced by the testes. Kidneys: The kidneys may malfunction. In severe cases, kidney failure may occur. During the course of untreated or even treated leprosy disease, the immune system may produce inflammatory reactions. These reactions can cause fever and inflammation of the skin, peripheral nerves, and, less commonly, the lymph nodes, joints, testes, kidneys, liver, and eyes. The skin around bumps may swell and become red and painful, and the bumps may form open sores. People may have a fever and swollen lymph glands. Symptoms (such as distinctive rashes that do not disappear, enlarged nerves, loss of the sense of touch, and deformities that result from muscle weakness) provide strong clues to the diagnosis of leprosy. Examination of a sample of infected skin tissue under a microscope (biopsy) confirms the diagnosis. Because leprosy bacteria do not grow in the laboratory, culture of tissue samples is not useful. Blood tests to measure antibodies to the bacteria have limited usefulness because antibodies are not always present. The good news is that leprosy is curable. In 1981, the WHO recommended the use of a combination of three antibiotics -- usually dapsone, rifampin, and clofazimine -- for treatment, which takes six months to a year or more. Certain cases may be treated with two antibiotics, but rifampin is a key component of either regimen. Since 1995, the WHO has provided these drugs free of charge to all leprosy patients worldwide. During the course of treatment, the body may react to the dead bacteria with pain and swelling in the skin and nerves. This is treated with pain medication, prednisone or thalidomide (under special conditions). Multibacillary: The standard combination of drugs is dapsone, rifampin and clofazimine. People take rifampin and clofazimine once a month under a health care practitioner's supervision. They take dapsone plus clofazimine once a day on their own. This regimen is continued for 12 to 24 months, depending on the severity of the disease. Paucibacillary: People take rifampin once a month with supervision and dapsone once a day without supervision for 6 months. People who have only a single affected skin area are given a single dose of rifampin, ofloxacin, and minocycline. Because the bacteria are difficult to eradicate, antibiotics must be continued for a long time. Depending on the severity of the infection and the doctor's judgment, treatment continues from 6 months to many years. Some doctors recommend lifelong treatment with dapsone for people with lepromatous leprosy. The major aim is to prevent or reduce complication, deformity and disability in body through Physical Therapy. By treating and helping the patient. What the disease of leprosy is? The possible complications and deformities resulting from leprosy. prevention of complication, deformities and disabilities. To respect themselves enough to take medication regularly and to take care of complications. To protect their own anaesthetic hands, feets and eyes. To keep their skin soft and supple. To keep their joint flexible. To preserve all posible movements of hands and feet. To keep their muscles strong. To use their hands, feet and eyes safely, in daily work. To protect and prevent further damage and deformity. To improve and restore function. To improve appearance of hands, feet, face and eyes. Tendon Transfer: Moving the distal end of the tendon to a new place so that contraction of muscle belly will produce a needed movements used to replace paralysed muscles. Example- Transfer of fore-arm muscle to make finger movements. Tendon Lengthening: Lengthening the tendon of a muscle to permit more movement and reduce contracture. Example- Tendo Calcaneus lengthening. Capsulotomy: To loosen tight joint capsule often done with tendon lengthening and tendon transfer to improve range of motions. Tighten the loose joint capsule using suture. Arthrodesis: Elimination of unstable and deformed joints. Tenodesis: Attach a piece of tendon across the joint to reduce the movement. The tendon then act as ligament. Example- Tenodesis of MCP joint to prevent hyperextension. To increase and regain range of motion. Improve muscle strength perticularly in muscles to be transferred. Clean supple skin in areas of surgery. Muscle re-education after tendon transfer. Safe use of any new restored skill in work. For increasing/regaining ROM: ROM can be increased by soaking the skin or part in warm water and then performing passive movement to the part affected. To improve strength specially in tendon transfer: Active exercise in all part in which surgery is performed. Clean supple skin: It is provided by soaking the part in soap water, rubbing off thick skin, oiling, self massage and protecting the part from infection. Home care: teaching skin, hand, foot and eye care to groups and individuals and teaching the patients actual home care. Protect tissue during healing: Rest, body position and POP cast. Prevent/Reduce swelling: Elevation, active and passive exercise. Muscle Re-education after tendon transfer: Teaching new restored skills in movements provided by tendon transfer. Self restored skills in daily work: Teaching patient ot use any new skill safely in specific task. Providing hand, eye and foot protection. Rodrigues LC, Lockwood DNj. Leprosy now: epidemiology, progress, challenges, and research gaps. Lancet Infect Dis. 2011 Jun;11(6):464-70. doi: 10.1016/S1473-3099(11)70006-8. Scollard DM, Adams LB, Gillis TP. The continuing challenges of leprosy. Clin Microbiol Rev. 2006 Apr;19(2):338-81.